Inventory is the stock of any item or resources used in an Organization. Supplied Grey fabrics are first subjected to the 4 point inspection system and fabric allowance point is 28 per 100 yards. only those goods are stored here which are passed from the quality control department. And defected fabric are back to the supplier. The types of fabric defect are check in 4 point inspection system. Example: Suppose inspected fabric length=100 yds, fabric width=50 inch, and following faults are found. Various types of fabric and accessories such as sewing tread, button, interlining, zippers, label etc are stored in central room. Here also machine sparse parts and stationary are stored in store room. Issue fabric to cutting room. Fabric is separated and stored according to lot number. ii. Care label: It contains care construction. Different types of care label are given below. iii. Cost label: It contains the cost of garments. iv. Composition: It contains fiber composition of the fabric. Ex 65% cotton, 35%polyester. Many types of button are available in store room. Some examples of button are given below. There are two systems of determination the amount of amount. These are given below. Special type of accessories used in jacket, bags etc. To reduce and increase the length and also for better fitting, it is used. 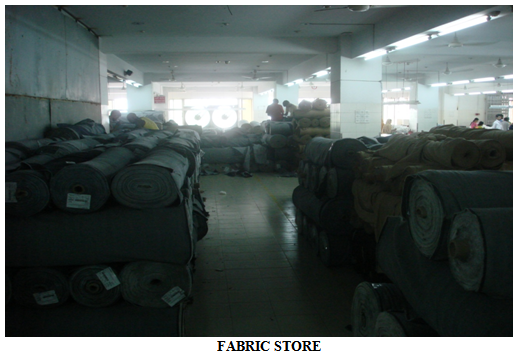 Types of interlining are available in store room are given below. Various types of packing accessories are available in store room such as polybag, packing board, tissue paper, hanger, scotch tape, gum tape, carton etc. Cartons are made according to buyer instruction and length wise it contains the buyer name, widthwise it contain the measurement, net & gross weight. Carton contain the information are printed by screen print style.